Want to guess what this week’s Watson Wire is about? 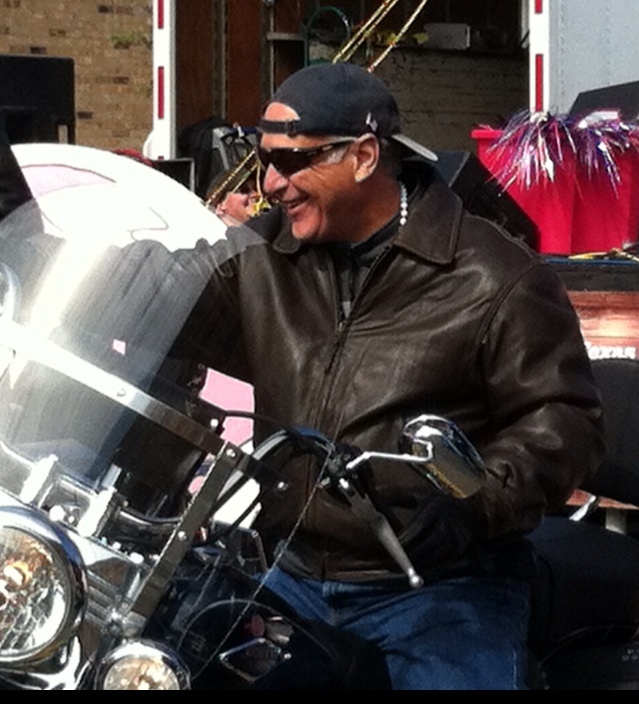 Here’s a hint: it’s not me on my motorcycle at the Hogeye Festival in Elgin this past weekend (though that was a lot of fun). No, this week’s Watson Wire is about the same thing that the last couple of Watson Wires have been about: Proposition 1 on the Travis County ballot right now. Now, the election is just a week away, and Early Voting ends on Friday. So I’m going to keep this short — because if you haven’t voted already, you need to close this email and run to the nearest polling place while you still can; and if you have voted already, you may find the Wire less informative and more, say … purely entertaining. But whoever you are, I hope you’ll vote (or have already voted) FOR Proposition 1. If there was one thread connecting all of last week’s news, it was how broad and overwhelming the support has been with what we’re trying to accomplish with Prop 1. Another big boost came from a rally of Prop 1 supporters, who gathered at Dell Children’s Medical Center and gave our community a wonderful visual of everyone – “Republicans, Democrats, Longhorns, Aggies, doctors, nurses, patients, senior citizens, men, women, women who are interested in women’s health issues … chambers of commerce … social service organizations … tough grandmas” – from every part of this community who supports Prop 1. The last endorsement was one of policy, not politics, but it might have been the biggest of them all. Late last week, the federal government gave its tentative approval of plans for the $130 million a year ($54 million in local tax revenues, plus an astounding $76 million in matching federal money) that Prop 1 would raise. This is a huge vote of confidence for what we’re trying to create. And as Trish Young Brown, our county healthcare district’s CEO, put it, the letter “gives us a path” to restructuring Austin’s health care safety net in a way that helps the poor and uninsured to be healthier, avoid the emergency room and save taxpayers money. To be clear, this funding – and especially the federal funding – can only be used for new projects and services that keep people healthy and cut the public’s costs. It can’t be used to pay providers more for things they’re already doing. As the article points out, not all of the opposition seems to understand this. All of this support helps reaffirm what I’ve been saying for months: Proposition 1 is an unmatched opportunity for Travis County to keep its people and its economy healthy. Watch the hand in the ad above: Prop 1 will help make Austin a center for treating cancer and other illnesses, ensuring you can get more cutting-edge treatments here without traveling to other cities. It’ll create 15,000 new, permanent jobs and about $2 billion annually in economic prosperity, plus the pipeline of doctors our region needs. It’ll allow for enhanced trauma services, longer neighborhood clinic hours, more prevention and wellness programs, and better primary, behavioral and mental healthcare. And it’ll pay for more doctors to treat Austin’s poor and uninsured, in part by purchasing the services of a new UT med school’s students and faculty to work in our community clinics, new teaching hospital and neighborhoods. 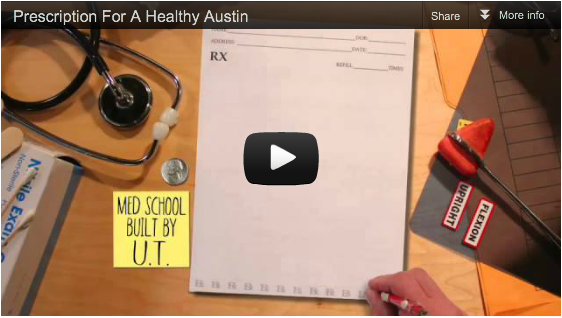 Let’s be clear: Prop 1 won’t be used to build a medical school or a teaching hospital. Instead, it will keep us, our families and our neighbors healthy by purchasing services and taking advantage of this new health care infrastructure we’ll help create. This should be one of the greatest investments our community’s ever made – in its health and its future. If you haven’t already, please vote FOR Proposition 1, either today, through the end of the week, or next Tuesday the 6th. And if you’ve already voted … As you were.